The white space of this landing page really allows for much more focus on elements like the icons, photos, and form. This landing page holds a ton of information all of which are broken into easy to read bullet points. Service businesses can list features and book appointments with this landing page. 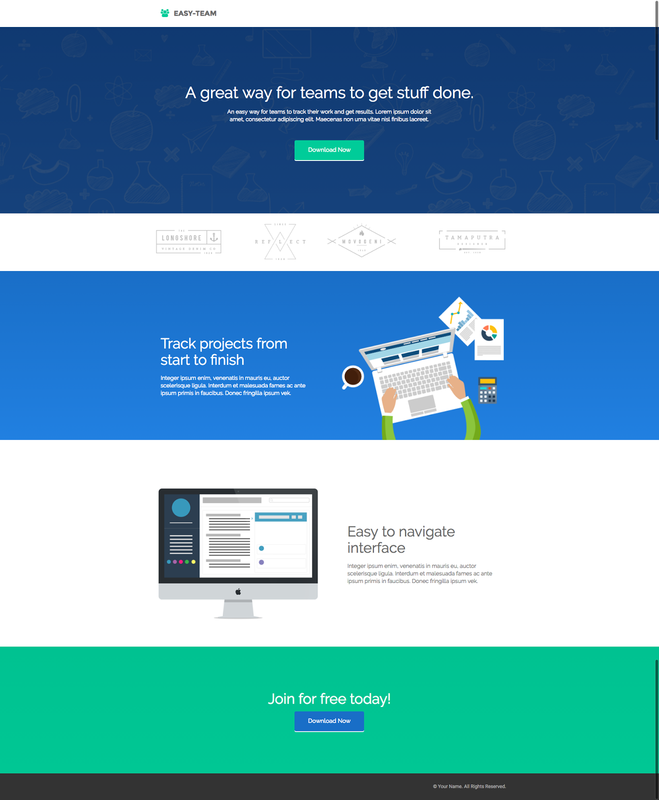 Tech businesses, SASS in particular, can use this landing page to book demos of their software. The imagery of this conference landing page is what makes it stand out. It lends well to events because it has a map to the location, a speaker gallery, and a visual agenda. Conferences that lists the speakers, agenda, and location. This would also make a great webinar page. Shorten it to half the length and include the webinar info. Clean imagery and visually compelling graphics. Quirky list of features and benefits. An app landing page that lists features, benefits, and USP. An easy swap could change this into a “coming soon” type page for a Kickstarter-like project. There is ample space for information and a compelling design for product highlights. We love this landing page for its fun and colourful personality. The testimonial stands out in a bright blue background and adds credibility. The portfolio highlights projects with bold imagery. A thorough contact footer makes it easy to get in touch with the owner. Creative pros that want to highlight their personal and professional projects. A few changes can transform this landing page into an agency landing page that collects leads and shows off creative projects. The CTAs are clearly visible and framed with colours and images. Travel: Book and register people for vacations or expedition adventures. Show off what your adventure tours have to offer and compare price packages. App or technology: Technology products or services can put their business up front and centre. The layout is well suited for graphs, screenshots and data. The strong use of colour amongst the black and white add more emphasis to specific sections. It is well suited for products/services that need to provide a lot of information. A law firm that needs to provide clients with plenty of information would be well with this landing page. They have an ample amount of space for testimonials, quotes, and reviews. Construction or industrial services would do well with this landing page too. The corporate style lends well to more information and client testimonials. The footer with the CTA and links to downloads. Centre alignment and clear use of icons. Apps or games suit this landing page well for its use of colour and imagery. Photography services can make photographs the highlight of the page with the simple addition of a gallery. 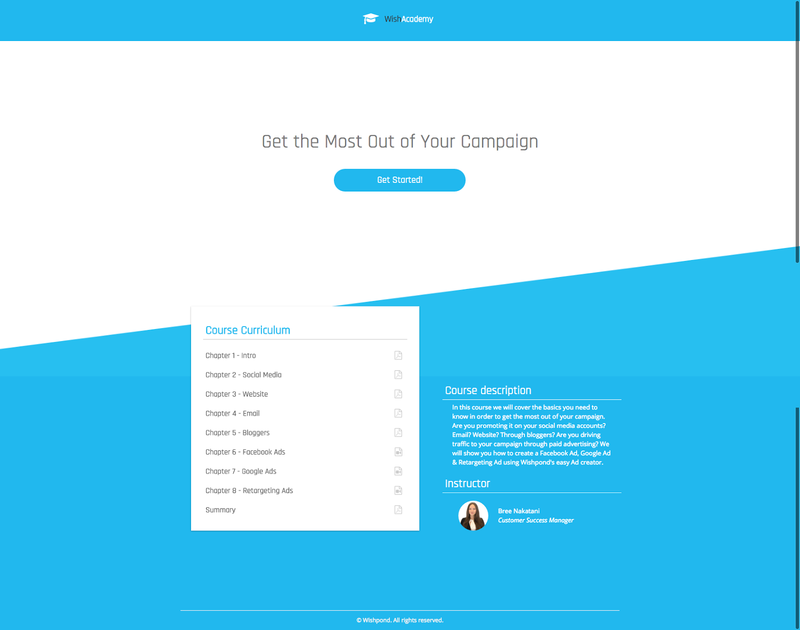 This landing page is well suited for anyone with knowledge to teach. It excels at featuring a list of courses and highlighting instructors. Online education: Course owner can expertly list their courses and class syllabus with ease. They can include testimonials from past students and highlight the skills of the instructors. Seminars: The simple layout makes this near perfect for highlighting a seminar for attendees. Simply change a bit of the imagery and add a location. Raw and unique, this landing page template excels at promoting informational products. It has quotes and social proof elements spread throughout the page. Adventure tours: Ebooks or info products are well displayed on this landing page. A bit more imagery and a well-produced video fit well amongst the text and information. Video production: Add in a couple of well-produced video and a link to your portfolio and this would make an excellent video production agency landing page. Get ready for adventure with this travel landing page. We love this template for its fun use of colour and flat icons. 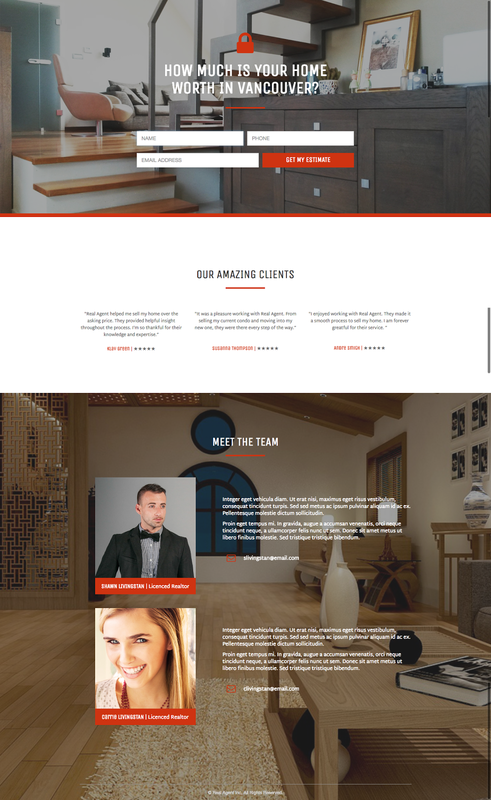 Users can use this as a full landing page or even a squeeze page considering its size. Travel agency: Incorporate themes from around the world with more photography. Add in some testimonials and client reviews and you’ll have a stellar travel company landing page. Ebook: This would also make a fantastic ebook landing page due to its simplicity. A large hero image of the resource and some preview information is all that is needed. What this template does well is simplicity. Nothing in the design overcrowds the text or muddles up the message. White space is expertly employed to frame each section and focus the attention on the content. Accounting: Numbers and data fit well with lots of white space. Complex data and information need white space and this landing page suits the objectives well. Consumer tech product: Highlight your new product with this landing page. Fun graphics and bold imagery would set this page apart from an ordinary product page. This landing page can technically be considered a “squeeze page” as well. 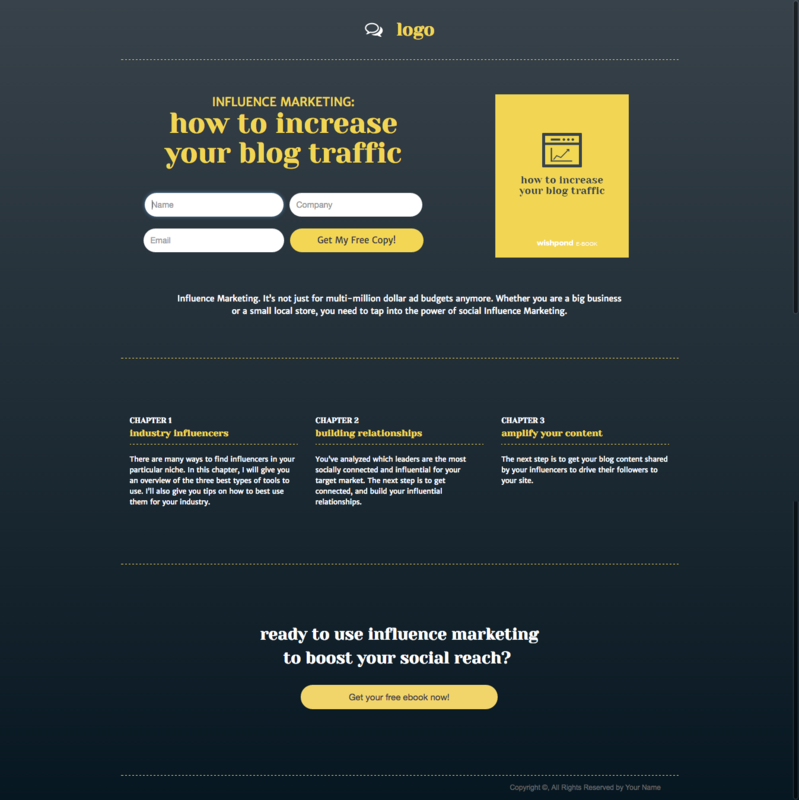 This page works to funnel visitors in with only a single CTA and form field. Webinar: Dissecting the page as it is, it makes for a great webinar squeeze page. The catchy headline makes funneling people into registration a breeze. Strong imagery. 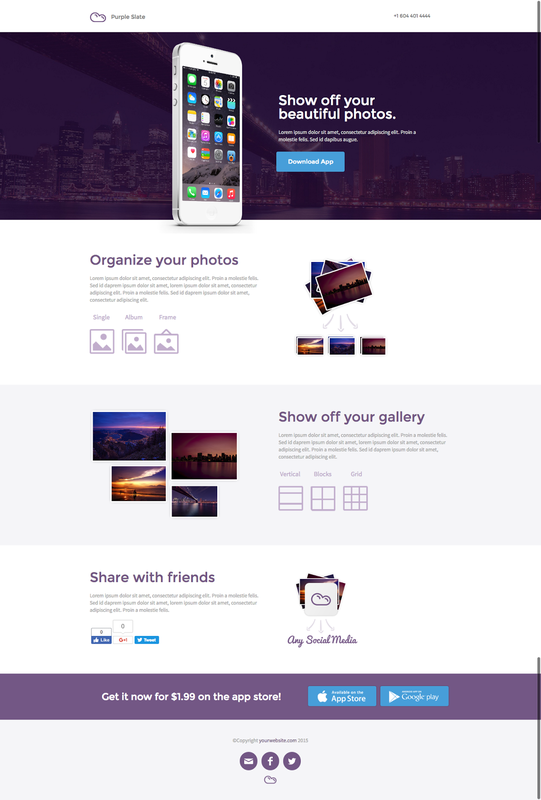 This landing page is meant to collect leads for a photography style business. A huge hero image frames the form and focuses the attention on the centre of the page where the info is. Above the fold things are kept simple, just the form and the webinar info. If visitors find it tempting, they can scroll down and learn more about the webinar if they choose. Conferences. Events that require the visitor to book a spot suits this landing page well. The information about the event fits the bottom and things are kept simple at the top with registration only. Wedding page. A quick change of imagery and information about your wedding can change the whole theme of this page. Strong imagery makes this a compelling landing page. 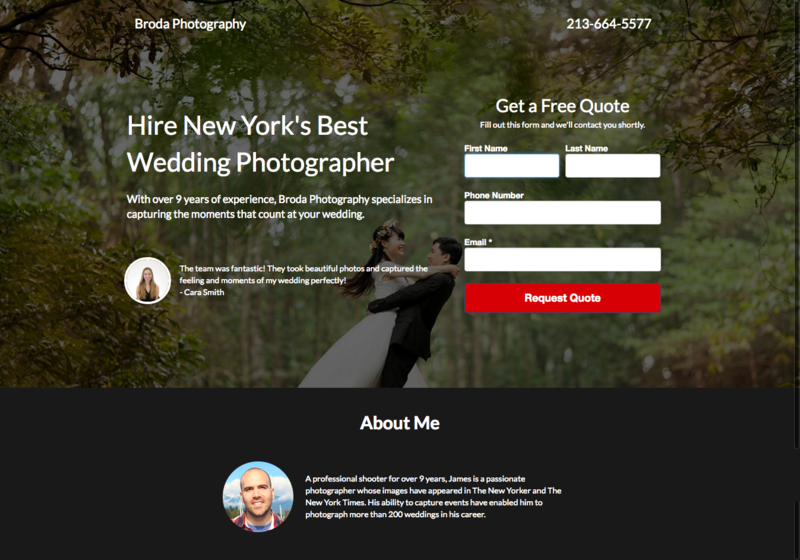 Photographers or any sort of product based business can use this landing page to visualize their offer for their audience. Restaurant. 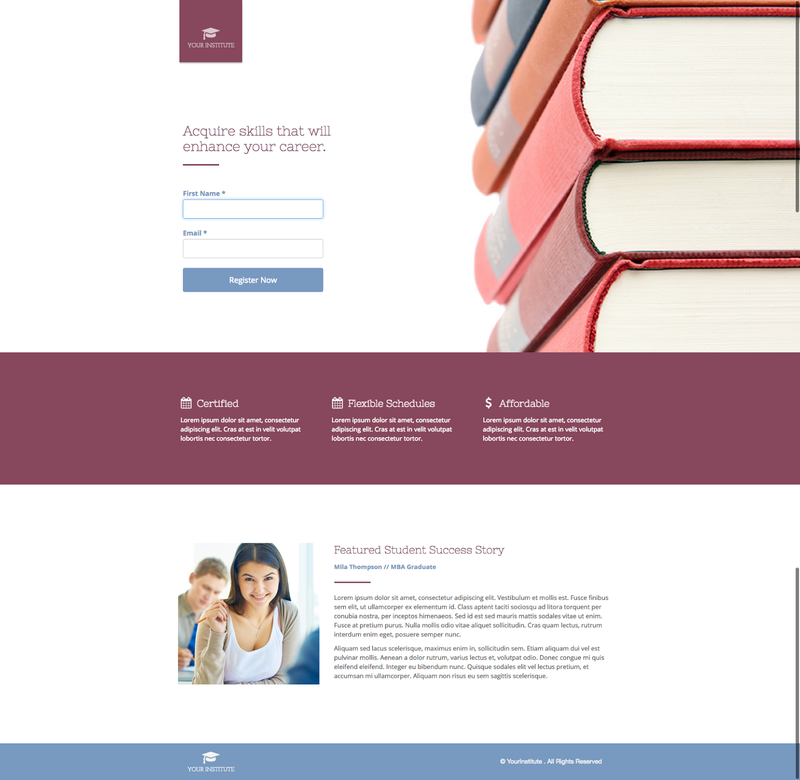 Book reservations or provide information with this landing page. Add in an area with contact information and you’ll have a fully functioning website for your restaurant. Ebook. Change the hero image to something related to the content of your ebook. A single form field collects emails and you send out your resource. Easy peasy. Cleaning service. Clients can book and request info for your cleaning business. List the benefits and features, and use the section below to add in a little social proof from previous clients. Trade service. 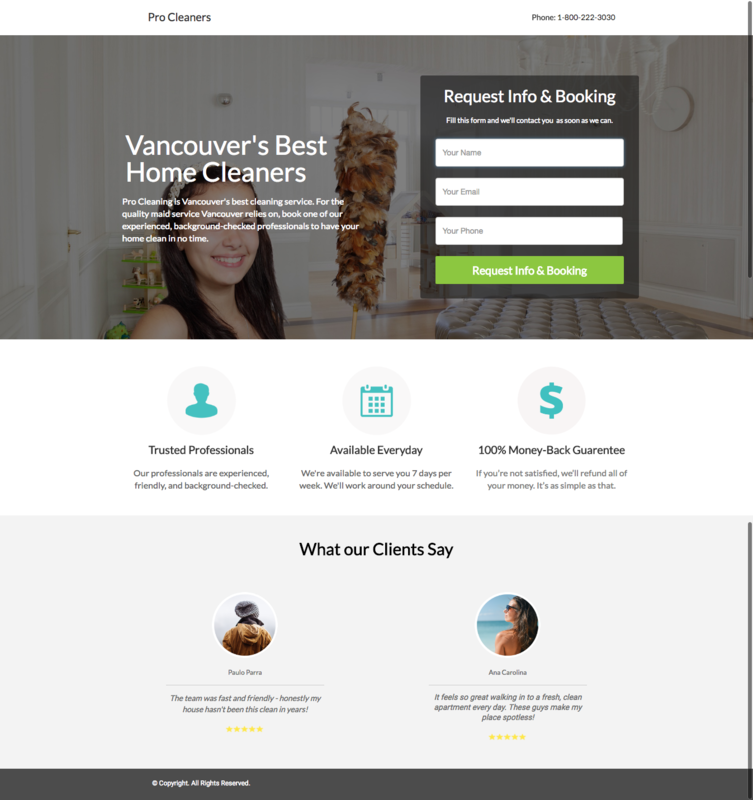 Any sort of trade service like plumbing or electrician can use this landing page to book appointments or send out additional information. All that would be needed is a scheduling app embedded on the page. Booking services. Use this landing page as a tool to book and register customers for your service. 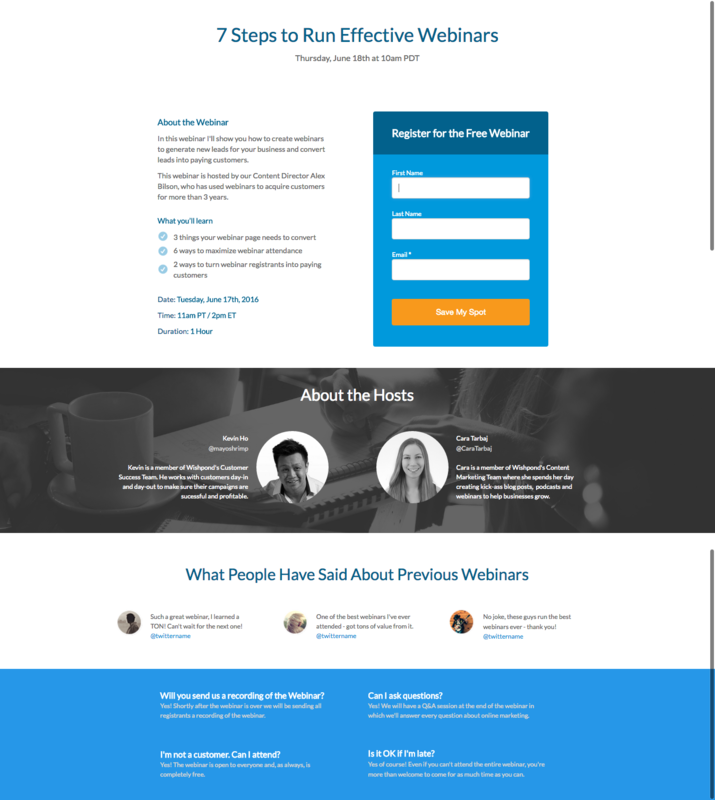 Ample space for a landing page video, testimonials, and benefits make this template a workhorse. Personal trainers can use this page to show off their client successes. A booking app embedded on the page can schedule training appointments. Realtors can also use this template to register clients for showings. Simply change a few of the images and insert business information and you’ll have a fully functioning real estate landing page. Emphasis on imagery. This landing page excels at putting imagery up front and centre. For businesses that rely on visuals and real life examples this landing page is for you. We love the large hero footer image that can be replaced to highlight whatever you like. Realty. 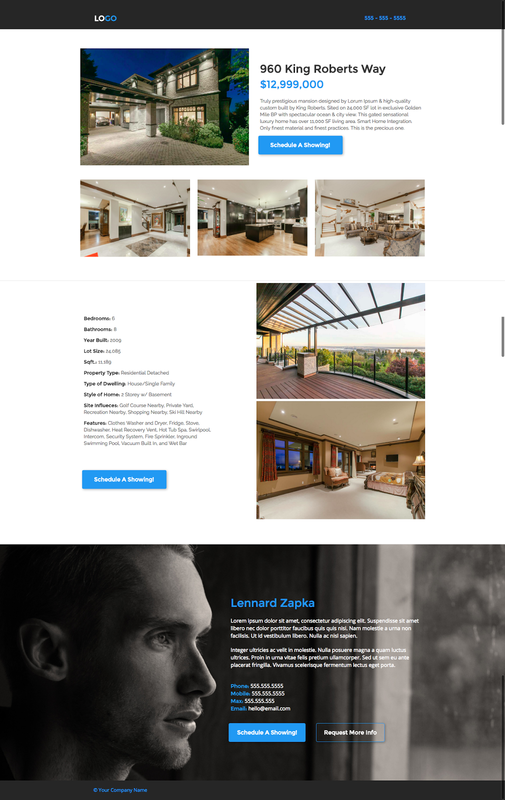 Realtors can put their properties up front and centre with this landing page template. The addition of a gallery and booking system can allow visitors to explore properties and book viewings. Clinics. Clinics can use this landing page to display images and information for potential patients. The addition of a booking system can register patients and help new ones learn more. Simplicity. The single large background image keeps things simple yet visual. It frames the information and leaves options to add more text. Photography. Photographers and studios can use this page to funnel potential customers into their booking systems. There is a lot of room for creativity with the images and also the potential to add more sections below. Restaurants. A few added sections would make this a clean and simple restaurant landing page. Restaurant goers would land here to learn more about the restaurants and view the menu. Smart use of colour. The text and information sections are kept simple and colour is only used to act excitement to the landing page. Startups. 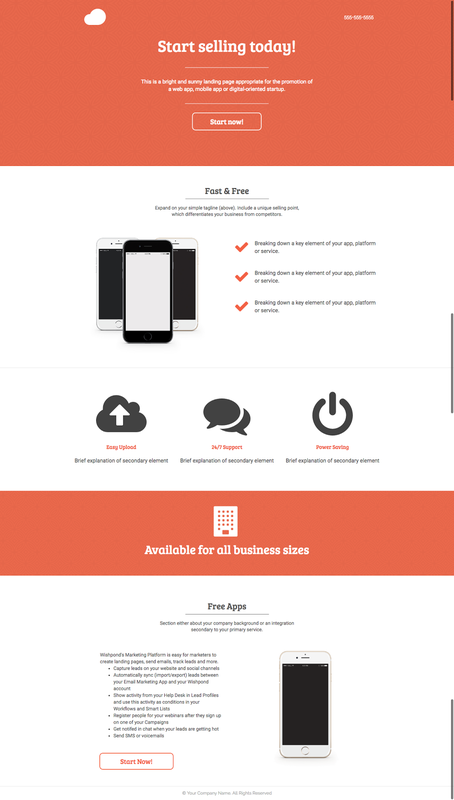 Promote your new app and have new customers learn about your USP with this landing page. A few images and some information about the problem you’re solving can turn this into a powerful tool for collecting new customers. Gyms. 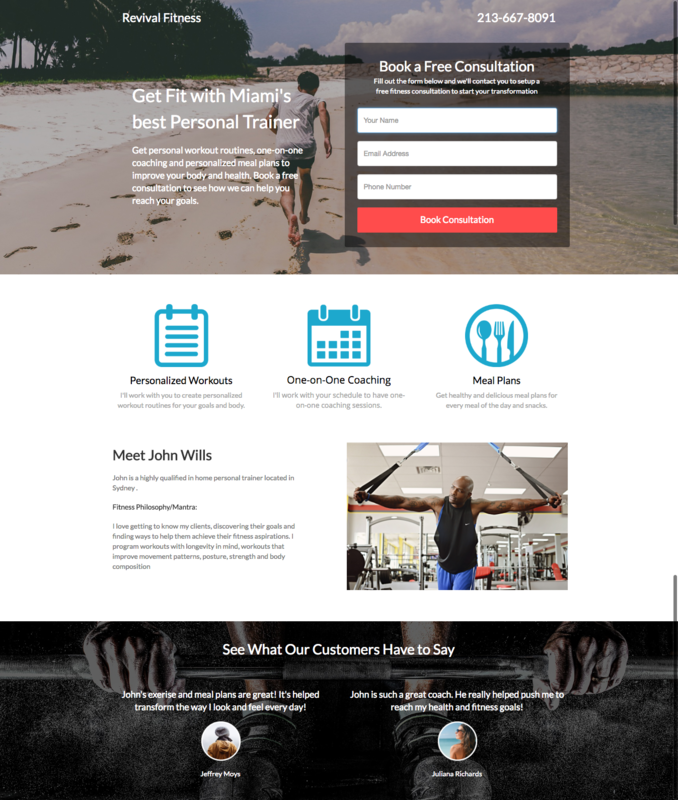 Change a few of the images and highlight the results your gym goers receive and this landing page will do wonders. With the right offer like a free trial membership, this landing page can be the lead generating machine your gym needs. Motivation. The whole theme of this landing page promotes power and motivation. For gym goers they can get inspired to improve their health and benefits from regular fitness. This page does everything to inspire and include those who want to change their life. Fitness. 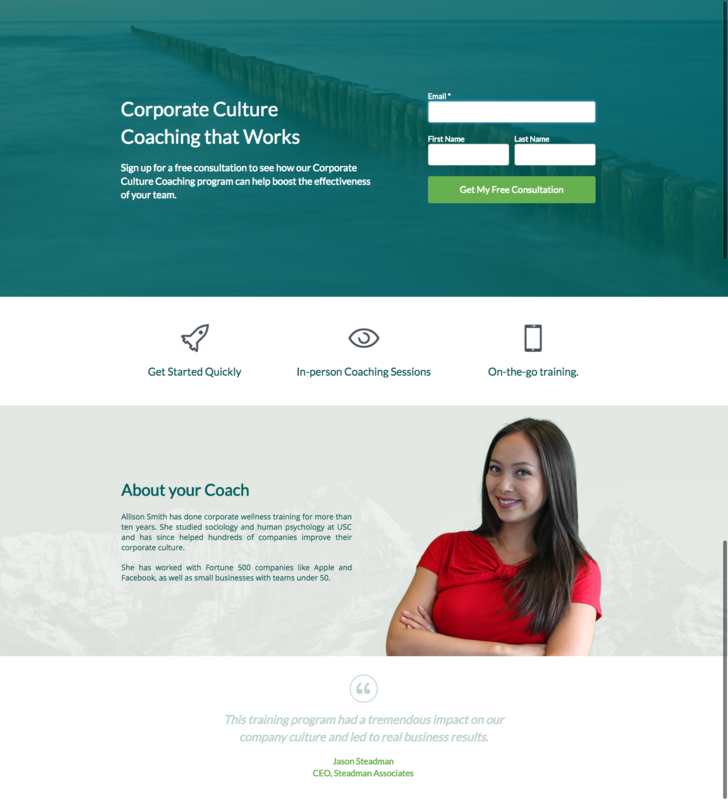 Client testimonials and transformation photos can take this landing page to the next level. Videos and social proof will take things even further. Restaurant. A restaurant with a classy or moody vibe could use this landing page to promote their edible offerings. They could add photos of their food and of their space to give all visitors a sense of what they’re offering. Clean. The well used white space and colours excellently highlight each section and make the offer more appealing. 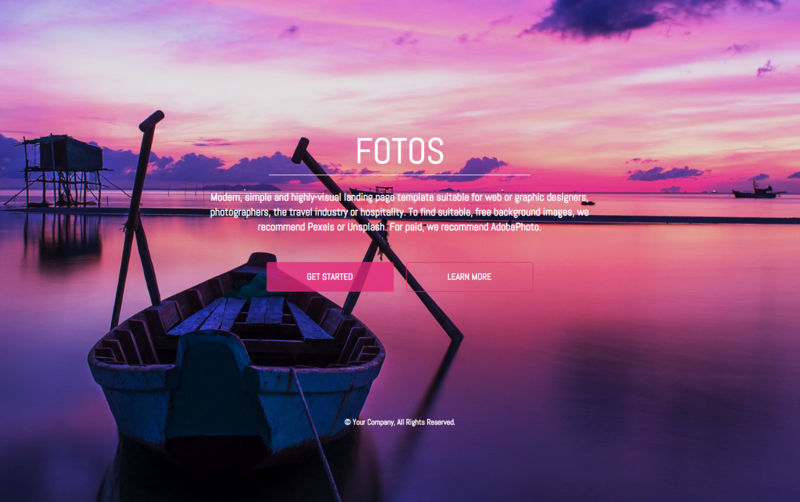 Beautiful photography and quaint testimonials take this landing page to the next level. Restaurants. Include more imagery, restaurant information, and social proof and you’ll have yourself a clean, beautiful landing page. A menu section and contact section will make it easier for restaurant goers to find and explore what you’re offering. Book. Offering a literary gem to your audience? This landing page can be formatted to include snippets from the book and quotes. Imagery. This landing page plays with imagery very well. It uses a gallery feature that displays a large amount of images. 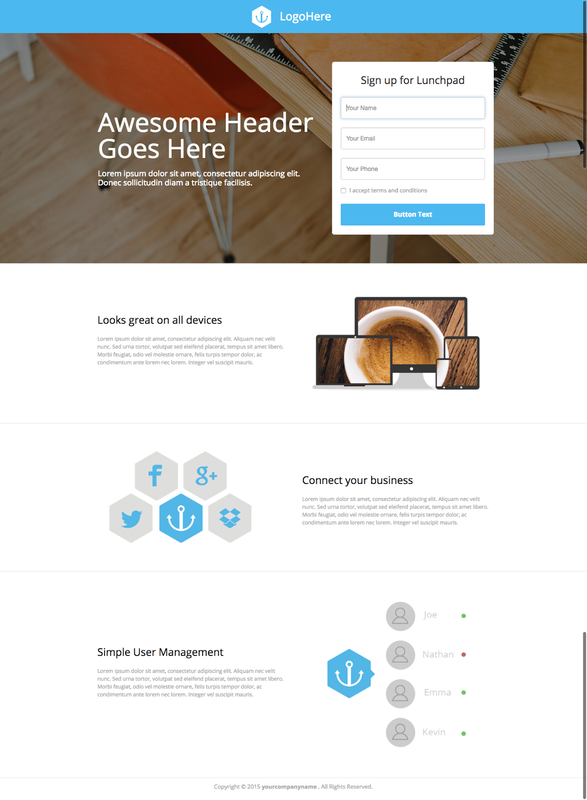 Any businesses that deals with a lot of visual components would do well with this landing page. Designers. The gallery shows off designer works in the best light. Each photo can be expanded into full view. Add in a few more sections with testimonials and information about you and you’ll have full fledge designer portfolio. Photographers. Fill the gallery with past photography work to show off your skills. Flat design. I like this landing page for its fun use of typefaces and ample white space. It would make a great landing page for ebooks or any other sort of informational product. Ebook. 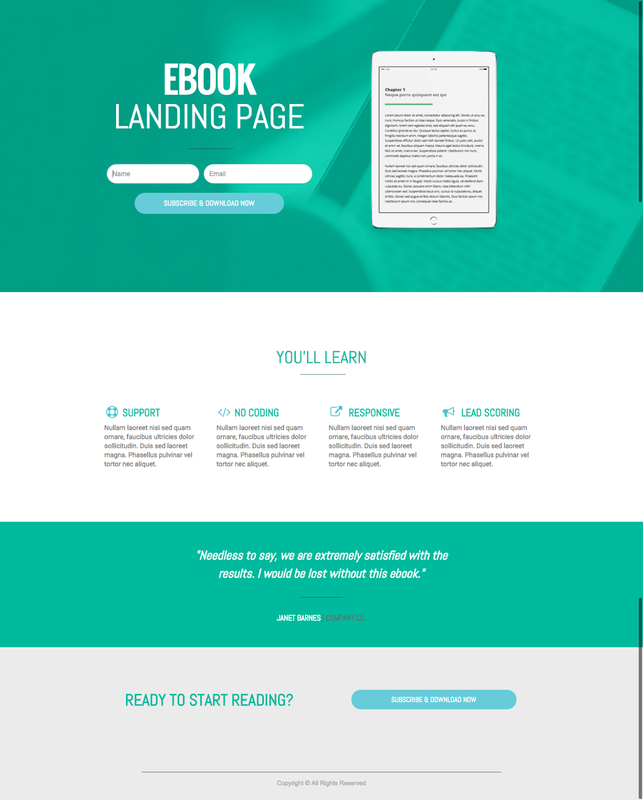 A large image of your ebook cover should be the focus of this landing page. Add in some short and concise copy explaining the appeal of the book. Webinar. Replace the image of the book with photos of the instructors and the include information about the webinar. Change the language and CTAs so that they match the style and theme of your event. Bright colours. A business that is bright and cheery would do well with this landing page. It uses bright colours and ample white space to highlight each section to draw visitors into the offer. Ebook. A strong headline and example front-cover would suit this landing page well. Visitors would be able to get a strong sense of what your ebook offers and what will benefit them by downloading it. Clinic. The bright colours and fun theme would suit a health clinic well. More imagery and booking form field would make this landing page appealing to potential clinic visitors. Visual. We like this landing page for its strategic use of imagery. Real estate businesses have space to include testimonials and images of their properties for potential investors. Retail. Photos of your retail store and product shots fit right into this landing page. Visitors can learn about your story and see what kind of product you offer. Real estate. The layout of this landing page lends itself well to visitors that need to explore a physical space. Strong imagery and well positioned text makes it easy to show off and amaze. Casual. The design of this landing page says sophisticated yet original. The fun typefaces and well placed imagery make it a unique experience for visitors. Restaurants. A menu section and a section for beliefs and value could make this landing page suit a restaurant well. Images of food and fun would lend itself well to a diner or a sophisticated bistro. Wedding planners. A slight change in colour and some wedding imagery would transform this landing page into a bright and immaculate theme. Here visitors can learn about your wedding services and plan for their special day. Focused. 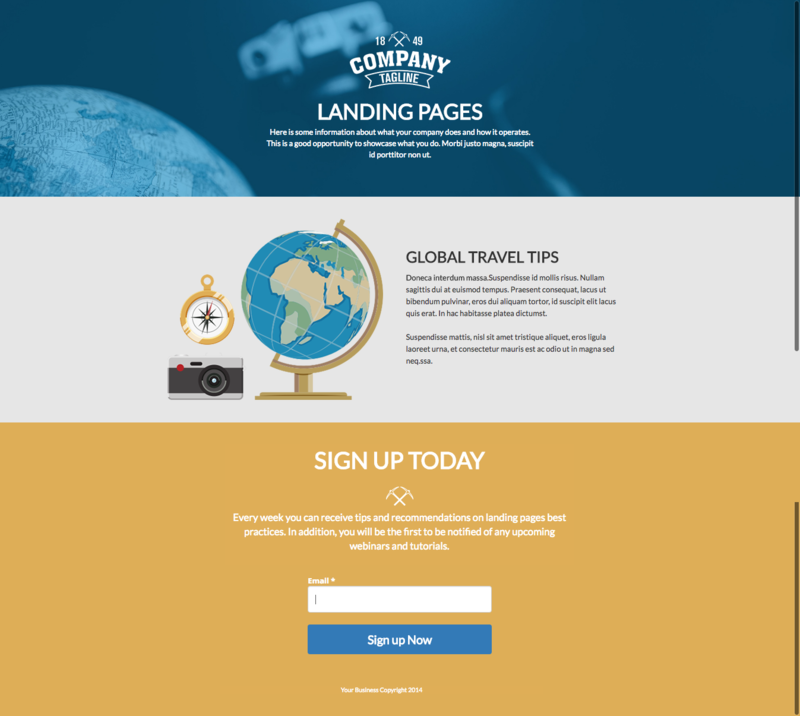 Let this landing page squeeze your visitors onto the next step. 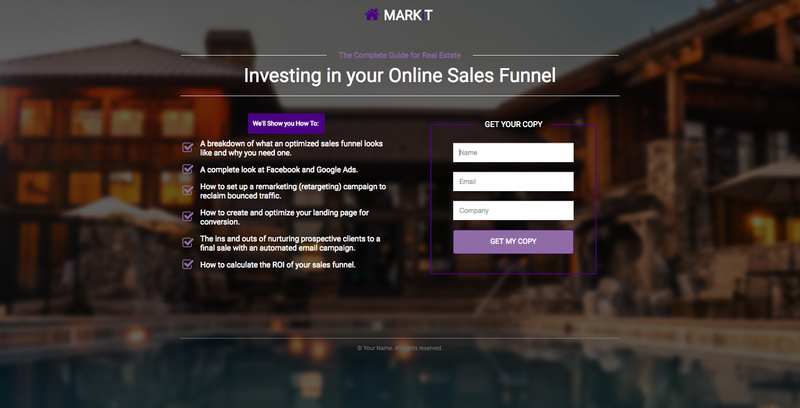 By offer something like an ebook this page with funnel visitors down the page and into your email list. Ebook or resource. Offering a value-packed resource for your audience? This squeeze page has room for a bit of information and a form. It keeps things simple and focuses on just collecting emails. Webinar. Instead of offering a resource, use this page to offer a value-packed webinar. 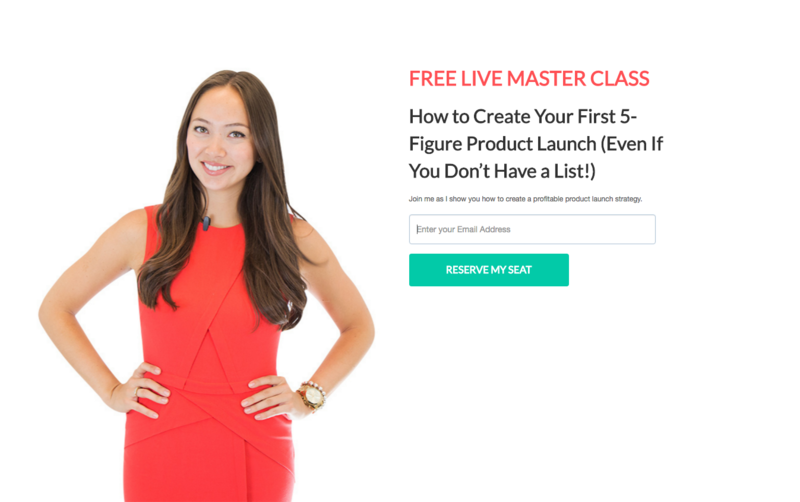 Plenty of marketers use a landing page just like this to reserve spots for their webinars. Add in the instructor bios, add a registration form, and some info about the webinar and you’ll be good to go. Attention grabbing. The bright and smart use of colour make this page an attention grabber. The information is highlighted by the colour making each section easy to read and understand. Webinar. Listing out course curriculum is a breeze with the embedded list. A few form fields can be added to register visitors and alert them when the webinar starts. There’s space for instructor bios and a short description of the course. Ebook. To turn this into an ebook landing page a book cover image is needed for visitors to observe. Using a mockup of your ebook makes the offer seem more tangible thus more credible. Simplicity. The smart use of a list on the left hand side makes listing information simple. A course on real estate marketing for example, only needs to list benefits and features to get readers to register. 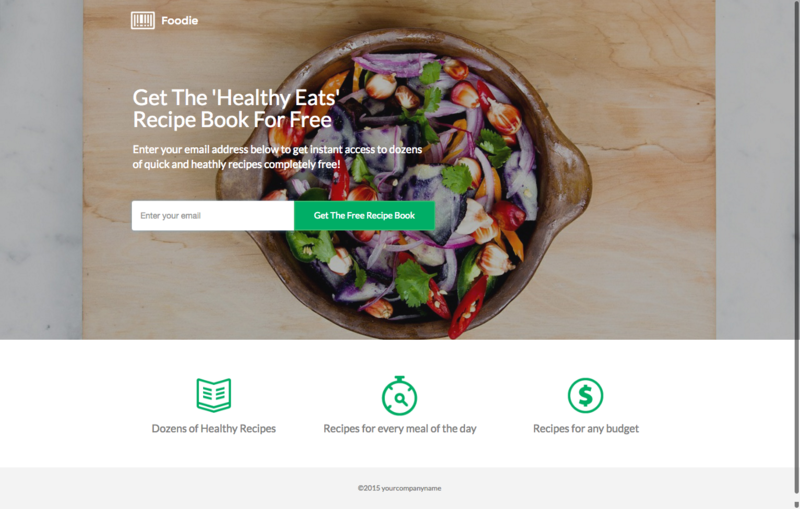 This small squeeze page makes conversions easy and stylish to boot. Online course. Registering visitors with this course squeeze page is easy as pie. List out the course information on the left and use a simple form to register visitors. Designer resource. 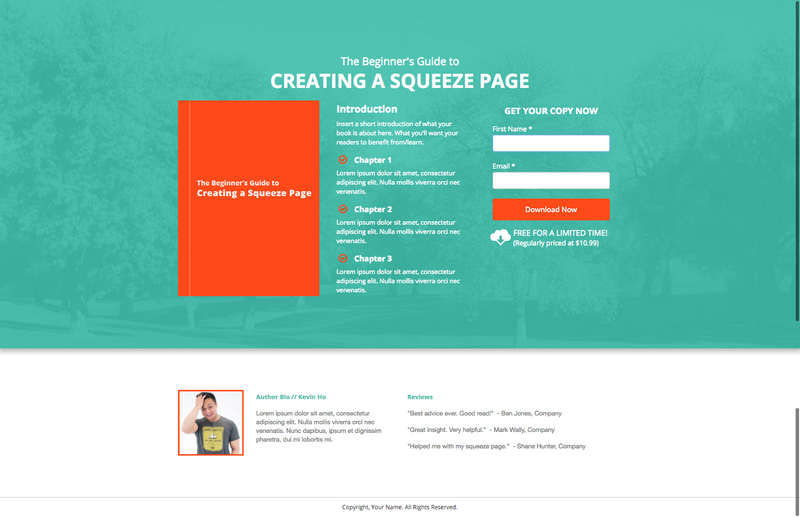 Designers or photographers can use this squeeze page to offer a free resource to their audience. A simple description of the Photoshop template for example, can be shown on the left. Then the form on the right captures information and the resource is sent through email. Lightness. The use of graphics, typefaces, images, and spacing keeps this page light and super easy to read. Medical services. 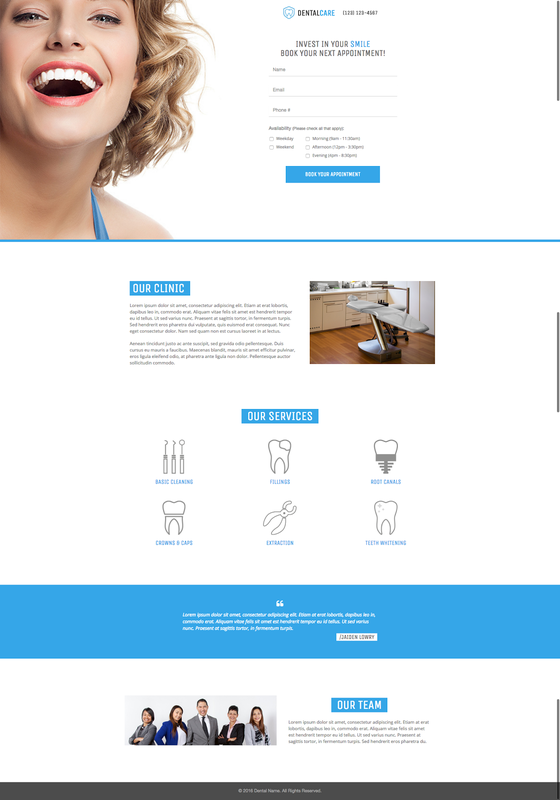 Dentists, doctors and the like could use this landing page to list out their clinic’s features. The clean design and smart use of graphics make it easy for patients to understand the information they need to know. Agency. With sections to show your team, services, and portfolio this landing page would make a great agency page. 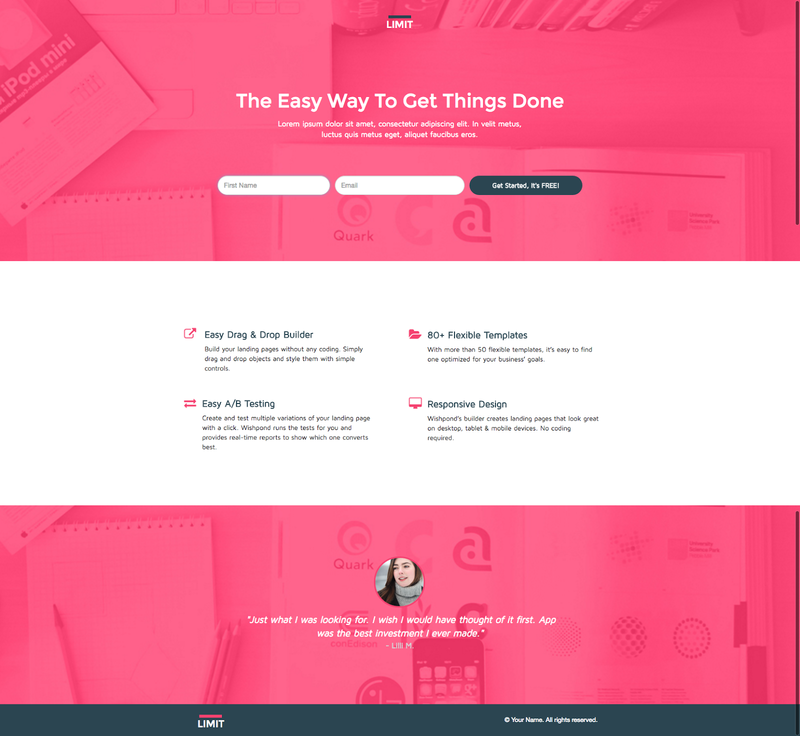 No matter what type of agency, this landing page keeps things simple enough to change and add information for your agency. Professionalism. The look and feel of this landing page lends itself well to professional institutions. A government body or educational organization could use this page to highlight its information and reach a new audience. University. For new students and prospective applicants that need more information they would come to a landing page like this to apply for information packages. Government services. Information packages and digital brochures are easy to apply for on a landing page like this. A few more form fields and some added images would be all it takes to transform this into a government information page. Strong use of a single colour. The colour on this page helps the content stand out. For something like a tech business, this landing page highlights information well and doesn’t crowd the content with design. Coming soon. For an app or service that is yet to be released, this landing page could collect visitor information until the time of release. Features are prominent in the middle and testimonials sprinkled throughout would provide credibility. Online education. To offer an online education course all that is needed is a few more form fields and a list of courses. Instructor bios can be inserted at the bottom for more trust. Natural. 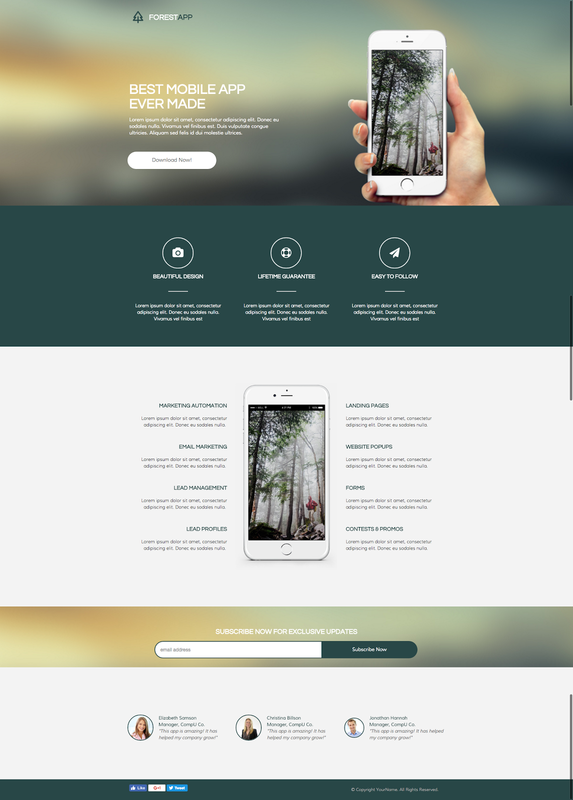 This stunning landing page plays well with colour and nature. The flat design and bold imagery is well suited for any sort of tech or adventure type business. App. Big bold imagery can be used in the hero image. A strong features list and demo images can be placed throughout. We can see an app like Airbnb using a landing page just like this to show its listings and friendly users. Adventure tours. Images of the great outdoors is all that is needed to turn this into an adventure company landing page. The colour scheme and styling lends itself well to that ‘natural’ feeling. Clean design. 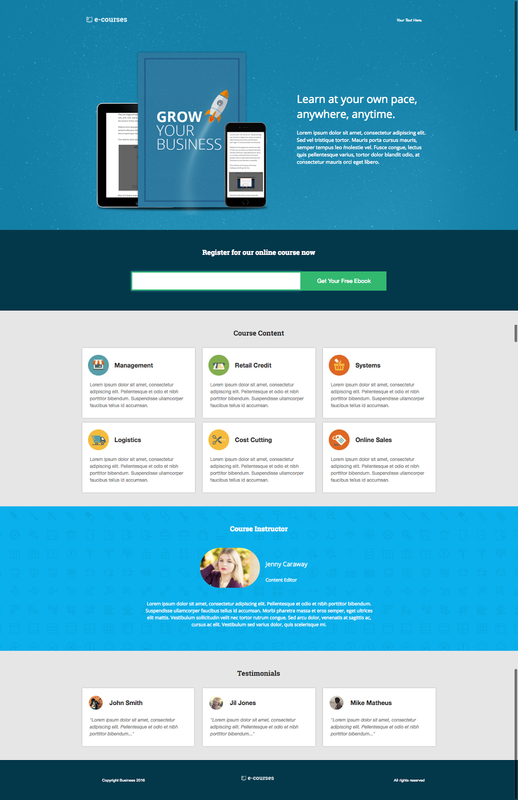 This landing page focuses on the benefits and features of the business. Fun flat icons are used to highlight business features and white space is used well enough to prop information up. Clinic. As it is, this landing page is already set up to promote any sort of clinic type business. Graphics make each point easy to read and the anchored form field makes patient registration easy. Mechanic. Flip the switch and change the imagery to auto themed images. List your mechanical services and maybe choose a darker colour theme. Add in a few testimonials and visitors with auto troubles won’t be able to resist. The Breaks. This landing page breaks ups information excellently. Each section uses fun graphics and a bright colour to stand out of their own. This format makes it easier to list out features and support them with images. App. List our your features and benefits and support them with images or graphics. Subsections can be added for things like company partners and testimonials. A form can also be included to collect leads directly on the landing page. Barber. A barber shop can list out their features and benefits easily on this landing page. Real photos of the shop and of happy customers would make for a compelling visual landing page. Professional. 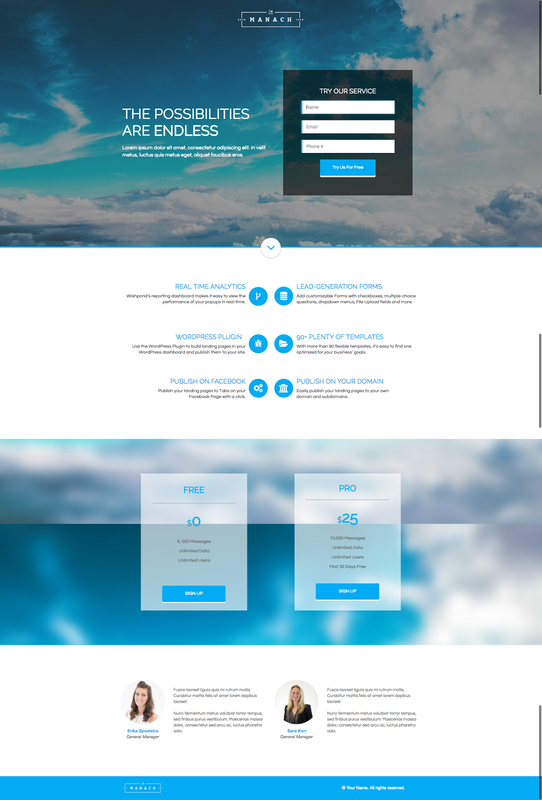 Take to the skies with this clean and professional landing page. 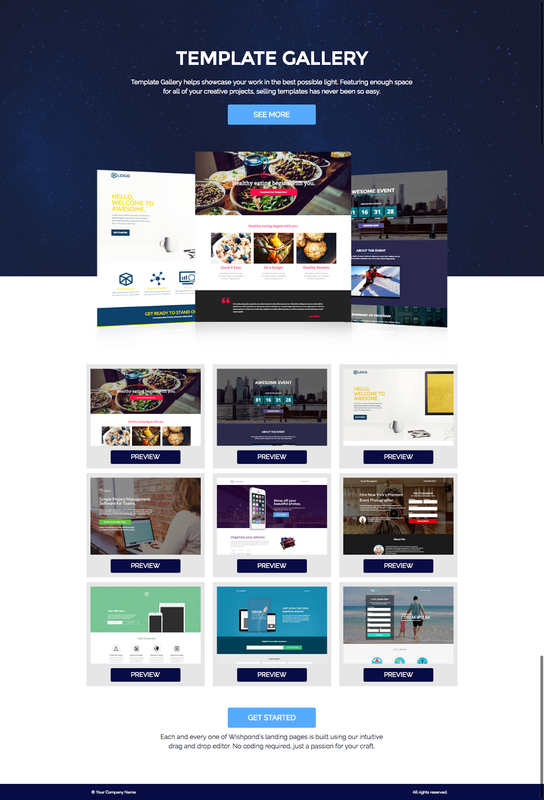 This landing page would suite any sort of professional tech, government, education, or service type business. Travel agency. An agency could fill the page with new flights and holiday adventures for potential clients. They’d list the benefits and provide compelling testimonials to register users. The clean and professional style makes it easy to highlight benefits and demonstrate value. Tech or IT. The theme here really suits enterprise clients that are seeking professional services. Nothing too flashy or overwhelming crowds the information and takes away from the message. An IT service would have no trouble listing their successes and benefits for clients. There is also a pricing section to avoid any confusion.